What do you think? It was certainly a fun project to put together. Also a special book trailer – Brent Week’s THE BLACK PRISM is my all-time favorite book trailer. What are yours? UPDATE – Here’s the list of Beta Readers! I want to thank everyone who has agreed to help me out and make Sworn To Transfer the best book yet! Let’s do this. The draft for SWORN TO TRANSFER is almost done and I’d really like some reader feedback. I’m hoping to get a well-rounded group of beta readers composed of teens as well as adults. If you haven’t done this before – don’t worry about it. I’m looking for feedback as detailed as you want (i.e. Terah you missed a semicolon in the second line of paragraph four on page 87) or as broad as you want (i.e. I really didn’t like that Steve character – he’s too angry – change him ASAP). You would be emailed the manuscript/Word doc by July 30th, and you’d have approximately fifteen days to provide feedback (I’d need it back by August 15th). Please only enter if you’re available during this timeframe. 2) Are you a teen or an adult (18+)? I will post my list of beta readers on Monday July 22nd, so check back then!!! Thanks so much!!! There’s all sorts of stuff going on right now, so sit back, grab some popcorn and let’s get cracking. STT is almost ready and I’m giving away TWO brand new print copies of the latest book in the Courtlight series on Goodreads. The two (AUTOGRAPHED w/ a beautiful bookmark) are listed here, and you can sign-up to win one if you’re interested. I’m on Twitter @TEdunWrites – tweeting reviews and answering questions whenever I get @ replies. I’m also back in the United States which will make my reply time more normal. 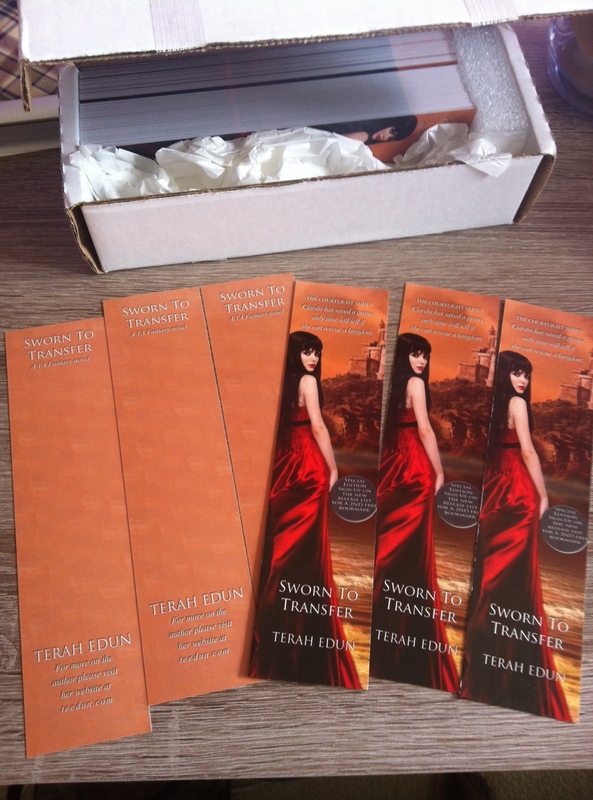 In addition to the print giveaway on Goodreads, copies of Sworn To Transfer will be available for review on NetGalley TEN DAYS before the release. Yes, you read that right bloggers – you’ll get it first. This time they’ll be up through my NetGalley Co-op All Night Reads. Watch my Blog and Twitter account for the announcement. Yes, I’m working on some free goodies for all of my lovely readers. 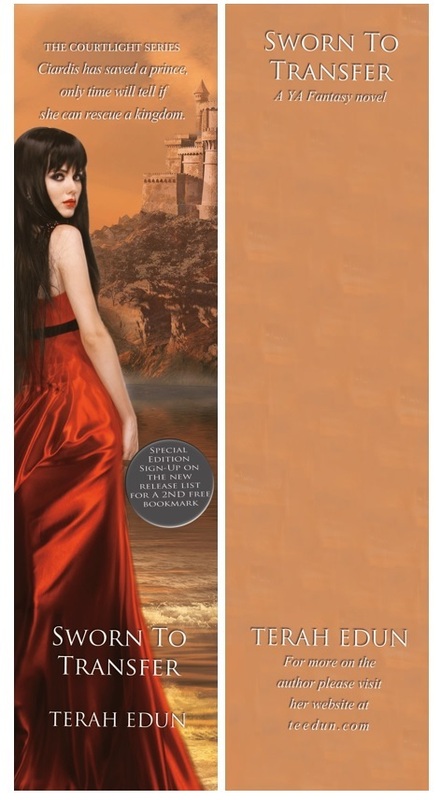 I’ll be giving away BOOKMARKS quite soon. What do you think of the design? 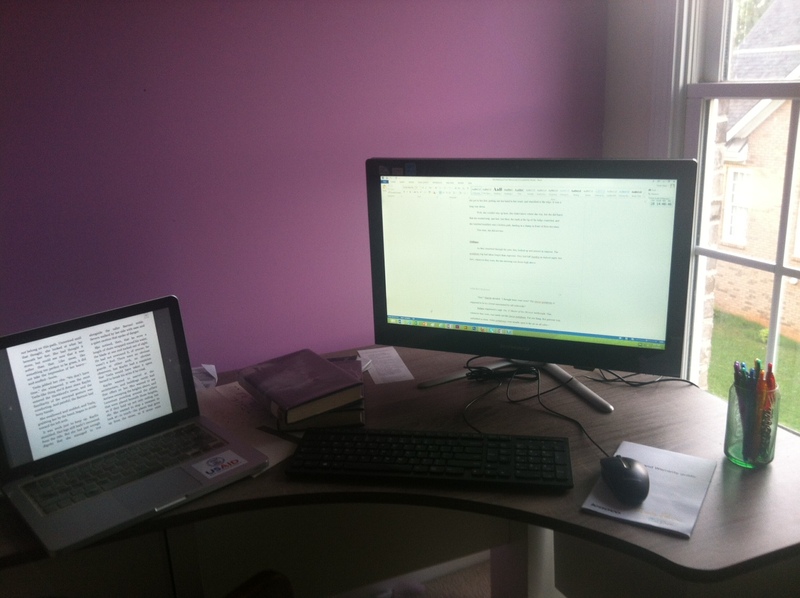 I leave you with a picture of my workspace.